Open any mail folder containing a message from Shutterfly. 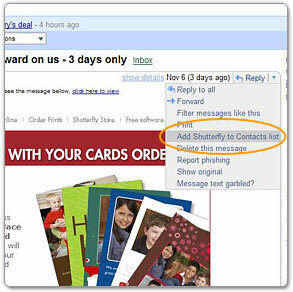 Open any email message from Shutterfly. The email address field will be pre-formatted with the address displayed in the sender’s message. Note: If Enable Email Controls is set to Yes, then you are restricting incoming emails. Open any message from Shutterfly. Select Always display images from shutterfly@shutterfly.messages2.com. Right-click Click here to download pictures in the light blue bar below the sender’s name, then select Add Sender to Senders Safe List in the drop-down menu. Select OK once the dialog box appears. NOTE: If you’ve enabled Image Blocking, please follow these additional. Otherwise, Yahoo! will block all images, including those in messages from your trusted senders. Select OK in the confirmation dialog box. Exit the Mail Options page and select OK to save your changes.